Choose your own software combo with discount. The more you choose, the cheaper you will get. Including popular Video/iPod/DVD/iPhone/iPad/Audio tools for Mac users to choose. 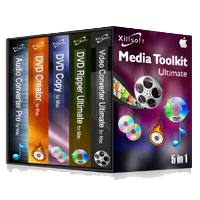 The best multimedia toolkit, Xilisoft Media Toolkit Ultimate for Mac, delivers the latest and completed solution for digital multimedia, including Video Converter Ultimate for Mac, DVD Ripper Ultimate for Mac, Audio Converter Pro for Mac, DVD Copy for Mac and DVD Creator for Mac. Xilisoft's new multimedia bundle contains video/audio editing and converting, DVD burning and ripping, DVD playback and creative projects in one complete package. This excellent Mac DVD pack contains 4 hot DVD/video products: DVD Ripper for Mac, DVD Creator for Mac, DVD Copy for Mac and Video Converter for Mac to help you complete all the DVD ripping, DVD creating, DVD Copying and video converting tasks. Xilisoft iPhone Software Suite for Mac includes DVD to iPhone Converter for Mac, iPhone Video Converter for Mac, iPhone Ringtone Maker for Mac and iPhone Transfer for Mac to convert DVDs/videos to iPhone video/music/ringtone, copy files between Mac and iPhone. Especially made for iPod fans on Mac, Xilisoft iPod Mate for Mac can transfer files between iPod and Mac, and convert DVD and video to iPod files quickly and easily with iPod Rip for Mac, DVD to iPod Converter for Mac and iPod Video Converter for Mac included. Xilisoft DVD to iPhone Suite for Mac is a discount pack including two powerful iPhone conversion software for Mac users: DVD to iPhone Converter for Mac and iPhone Video Converter for Mac, which can help you transfer any DVD movies and videos to iPhone.